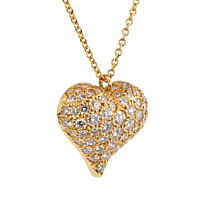 A lovely and timeless diamond heart gold necklace from Tiffany & Co. 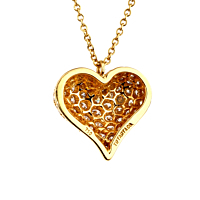 The heart shaped, concave 18kt yellow gold pendant is adorned with approximately 1 ct. of the finest Tiffany & Co round brilliant cut diamonds. Stamped in the back with the Tiffany & Co classic logo, it drapes gracefully from an 18kt gold linked chain with a classic closed clasp.